A color change gemstone that is not often seen is fluorite. Fluorite is known for its wide variety of colors, the most common of which is purple. Some fluorite colors are almost never seen, such as colorless fluorite and blue fluorite. Such uncommon fluorite colors are treasured by gemstone and mineral collectors. Indeed, a color that is not as often seen in fluorite is blue, making blue color change fluorite gems even rarer. These phenomenal gems are mostly sourced from Brazil and China. With a Mohs hardness of 4, fluorite is not an ideal gemstone for jewelry, but it is still very much popular with collectors. However, fluorite jewelry can be seen occasionally, usually set into protective-style mountings. Fluorite can make for beautiful jewelry, especially when worn in pendants or earrings since these are not exposed to as much wear and tear. Since most color change fluorite is faceted, and often with unique faceting techniques, it is certainly known to produce some of the most stunning jewelry designs seen today. We are all aware that the perceived color of an object depends on the viewer, the object and the light under which it is viewed. One example of how this works is the online "is the dress black and blue or white and gold" debate. We also may have noticed that when we go into a nightclub, an entry stamp can be seen under UV light, but not under fluorescent light. To perceive color we need the following three variables; light, an object and our eyes, and when one of these things changes, so does our perception of the object. Light which we see as white is actually a mixture of the spectral colors. When light hits an object, it absorbs certain colors or wavelengths, and the wavelengths not absorbed are the color or colors that we see. For example, something that appears blue will absorb all colors except for blue. Yet, it is not as simple and straightforward as this; each variable is quite complex, especially when it comes to gemstones. Daylight has a continuous spectrum, but fluorescent light has a narrow spectrum. This is why the true color of a gem is best seen in natural daylight. Even daylight changes according to the time of day, the weather and the part of the world. Other types of light include fluorescent light, which uses fluorescence (electromagnetic radiation). Incandescent light uses heat to produce light, either with a wire filament or a candle. The color shift in color change gems can be noticed under incandescent lighting, which has more orange, red and yellow. This includes candlelight. You may have noticed that candlelight is quite forgiving, peachy and soft on the human features, whereas fluorescent light is quite harsh and likely to expose facial flaws. This is why candlelit dinners are more romantic than supermarket canteen meals under the glare of fluorescent bulbs. Fluorescent light is bluish because it contains more blue wavelengths. To capture the different colors of a color change gem, it should be viewed under daylight and under candlelight, without other light interference. Some color change gems show a more dramatic change than others. 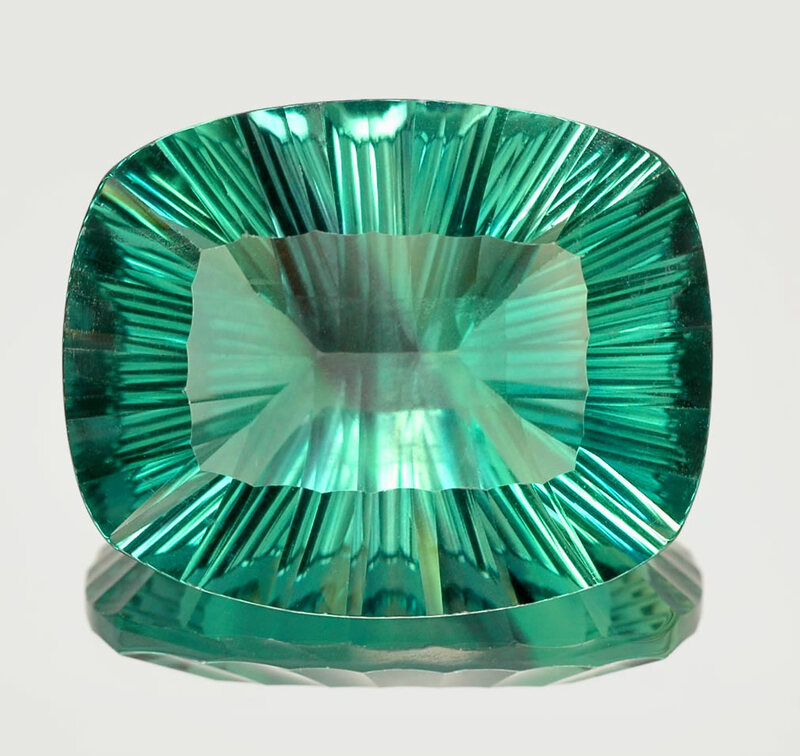 Color change is also referred to as "the alexandrite effect", due to the extremely rare color change variety of chrysoberyl, which exhibits a pronounced change of color when the lighting is changed. Color change in gems is caused by two variables; the type of lighting and visible absorption spectra. Color change gems tend to have two main transmission windows (usually to do with trace elements which impart certain colors), and under one type of lighting, one transmission window absorbs certain wavelengths of light. When the lighting is changed, the other transmission window absorbs other wavelengths of light. To explain this a little more simply, transmission is the movement of light through a material. Color change gems have two approximately equal-sized transmission windows (pathways through which light can pass) which absorb different light frequencies. Therefore, a color change gem such as fluorite appears blue under fluorescent light. This is because when light rich in blue wavelengths is shone onto the gem, it will appear blue because the gem will absorb other colors and transmit blue. Then, when incandescent light rich in red wavelengths is shone on the same gem, it will transmit red and absorb the other colors, or maybe it will transmit both red and blue, which makes it appear purple. While most people are aware of the main gemstone types, there are always new and exciting discoveries to be made in the world of gemstones. We at GemSelect are always on the lookout for items to add to our growing inventory. Color change fluorite from Brazil is one of our recent additions, so for those who are interested in phenomenal gemstones, color change fluorite may just be the right gem for you.